Channel settings are one of the most common engagement ring designs, but they are also one of the most beautiful. Whether used as an accent to a central stone or to add sparkle to a plain band, these simple settings are a popular feature on many engagement and wedding rings. A channel-set ring arranges diamonds in a line around the band. The jeweler creates a channel in the ring's band by adding a small metal lip on each edge. Diamonds or other gems nestle into this channel, and the lip keeps the stones securely in place. This setting allows the gems to take center stage. There are no individual prongs around each stone; instead, the metal lips keep the stones secure without detracting from them with additional metal. Because the gems are fully set into the ring, their fragile girdles are protected from chips. This makes the setting generally sturdier than higher, more exposed designs. Furthermore, if there are no elevated stones, the ring is less likely to snag on clothing or projections that could cause damage. Because the gems are enclosed in the channel, they have less exposure to light. This allows you to compromise on clarity without sacrificing the beauty of your ring. Many minor imperfections are hidden in this type of setting. Rings with channel settings can be more difficult to clean than other designs. They should still be removed during vigorous activity or while working with harsh chemicals. While these settings may help obscure minor flaws, the inlaid design can also impair the gem's color by giving it a faintly yellow hue. Because of this, many couples prefer white gold or platinum for channel settings, though many jewelers do offer a wide selection of stunning yellow gold designs. Because the setting keeps some of the light from hitting the gems, your channel-set ring may have less sparkle than alternatives like pave settings. There are many different ways to use a channel setting to add beauty to an engagement ring, and it's important to understand your options before you decide on your design. You can change the look of a ring by changing the length of the channels. The length of a channel depends on the number of stones used. Five to seven stones are popular, though smaller numbers, such as two or three gems, work well as accents. In this type of design, the stones in the channel are along the band in line with the center stone. This creates a continuous a line of gems with the largest, focal gem in the center. Another option is to use curved channels along the sides of the central stone, creating a wave illusion. This is a great way to set off the beauty of the focal gem and add sparkle to the overall setting. 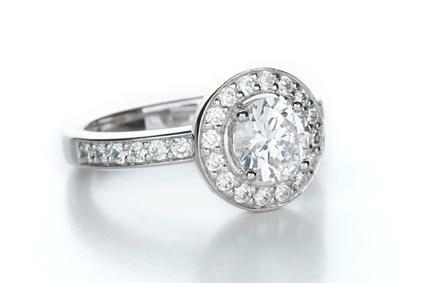 This design uses two or more channels to completely encircle the central stone, offering a halo effect. Using channel settings in this way allows you to visually enhance the size of the central gem. This is a common style of bridal set. Channels may seem ordinary, but detailed etching or sculpted accents either parallel or perpendicular to the channel can add texture and style to the ring. This offers a lovely way to bring additional personality to your engagement jewelry. In addition to basic styles, couples can also choose from different stone shapes in channels. 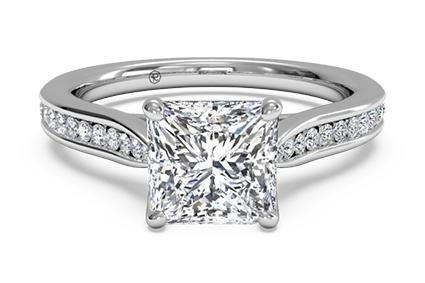 While classic round diamonds are a common option, princess and emerald cuts are also beautiful. Because their square edges guarantee there are no gaps between stones, these shapes give a continuous appearance that can be contemporary and lovely. More elaborate designs may have alternating stone shapes for even more distinction. Channel settings are popular styles for wedding and anniversary bands without an elevated center gemstone. Eternity rings are channel-set bands where the stones completely encircle the ring, creating a never-ending loop of diamonds or other gems. You can also use bridal wraps that incorporate channels to bring additional sparkle to a simple engagement band. 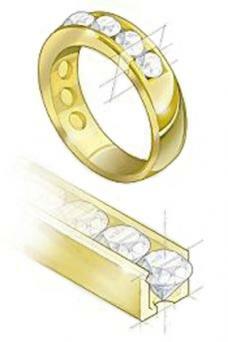 Most jewelers have a wide range of channel rings available, either as bands or accenting a more elaborate setting. You can buy these designs online as well. Engagement ring retailer Robbins Brothers has a great selection of channel settings in its modern design section. Here, you'll find a variety of contemporary settings with bypass channels, tapered side channels on the ring shank, and a number of other attractive designs. You can choose from white gold, yellow gold, or platinum and select the diamond or gemstone of your choice for the focal point. 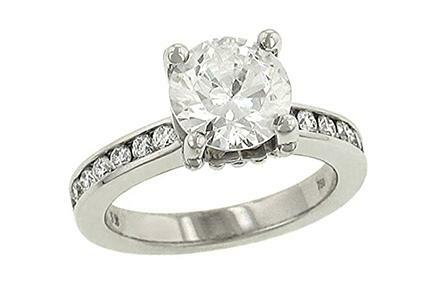 Prices for a simple 14k white gold ring setting with 12 channel-set diamonds start at about $900. If you're interested in something with a bit of old-fashioned charm, you'll find some lovely channel set designs at Solomon Brothers Fine Jewelry. Here, you'll see channel-set halos around center gems, channel settings that enhance the ring shank, and designs that feature delicate filigree and enhancement to the classic channel style. There are also channel settings mixed with pave accents for elaborate, sparkling statement rings. Prices for a narrow, channel set band in 14k white gold without a center stone start at about $800. Ritani, an online engagement and wedding jewelry store, offers an extensive array of channel-set rings. You'll find wedding bands, engagement rings, and a huge selection of bridal sets. This is a great place to find a matching set with diamond channels, and you should definitely check here if you're looking for this type of ring. Their engagement ring prices are for the setting only and don't include the center diamond. 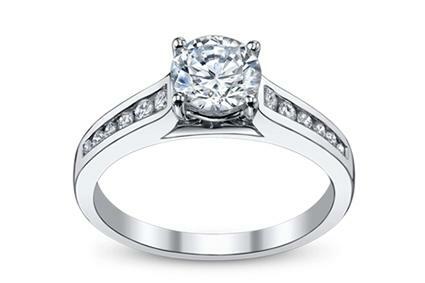 A simple channel set engagement ring setting with 0.14 carats of diamond chips in 14k white gold starts at about $1,300. If you're looking for something a little different than the classic channel-set ring, Emma Parker & Co. is a great resource. This jeweler has a variety of unique channel settings, including gorgeous halo styles, antique-style rings with engraving, contemporary bypass rings, and more. 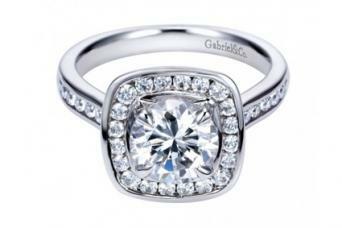 You'll also find a few bridal sets, although the main focus is on engagement rings. A 0.55 carat diamond halo engagement ring setting in 14k white gold without the center gem retails for just under $1,800. Examine the metal lips securing the stones. They should be smooth, free from defects, and wide enough to keep the stones in place but not so wide as to unnecessarily obscure the stones. Stones should be snug against one another, but flush. They should not exert pressure on one another. Stones should not be loose. The channel should be solid and secure, including underneath, to prevent stone loss. As with any significant purchase, be sure to investigate the quality of the jeweler and their return, replacement, and repair policies before completing a purchase. Channel settings have long been a staple design for engagement rings, but today's channel-set rings are more elaborate and elegant than many couples first assume. With many options for stone shapes, ring variations, and other design elements, there is a channel-set ring suitable for nearly every style preference.